In the latter half of the '80s, the world of European power metal was forged by bands like Helloween, Gamma Ray, and Finland's Stratovarius. Those names became synonymous with the genre as each group - and many others after them - released album after album of galloping, keyboard-laden metal. Being such a fixture, it serves little purpose for me to delve into a history of Stratovarius other than to mention the fact that the group seemed to have run out of steam early in the new millennium. All was not well within the band either, as primary songwriter Timo Tolkki was ousted in 2008. Polaris, released in 2009, was a highly anticipated album as power metal fans were eager to learn the effect Tolkki's departure would have on Stratovarius' elite status. The album received a lukewarm reception, though it was an improvement on previous releases. The band is back in 2011 with Elysium, and fans once again look for Stratovarius to return to their roots. That's not going to happen, at least not on Elysium. The album is good. Stronger than Polaris and light years ahead of the Elements series, Elysium is nevertheless just good but isn't great. Talent and skill abound, that goes without saying, but after the epic closing track fades away there's little staying power to speak of. Matias Kupiainen, who stepped in after Tolkki left, is a stellar guitarist and lays down some mighty riffs from start to finish. His solos are plentiful and ambitious, particularly on "Infernal Maze" and the title track. Something that stuck out as a negative, though, was the occasional tendency to lose Kupiainen's riffs behind the orchestrations of keyboardist Jens Johansson. On "Darkest Hours", for example, the keys are used nicely but they blur Kupiainen's fretwork during the choruses. This occurs again during "Fairness Justified", but to be fair (pun intended) there are far more instances where Kupiainen and Johansson complement each other. The heavy riffs of "Lifetime In A Moment", which make this a particularly weighty track, work well with the AOR atmosphere created by the keys. The strong gang choruses help make this song a highlight of the album. In addition to some nice, anthemic choruses, the vocal performance from frontman Timo Kotipelto is as solid as the musicianship shown by the rest of the band. Kotipelto's middle range is ideal for the sound that Stratovarius is going for on this release, though there are a couple of smudges to an otherwise remarkable effort. "Infernal Maze", a prototypical European power metal track, finds Kotipelto sounding a little thin when he reaches for the upper limits of his range. During the waning moments of the lengthy "Elysium", the pace of the track slows to a crawl and Kotipelto's vocals get to be a little rough on the ears. Those moments aside, there's very little about the vocals to give pause. Overall, Elysium has almost more of an AOR feel to it that straightforward power metal. Tracks like the slow-burning "Fairness Justified", the power balladesque "Move The Mountain", and the various movements of the standout title track eclipse the scorching pace of "Darkest Hours" and "Event Horizon". A return to the early days of Stratovarius this album is not, but it does once and for all alleviate the concern that Stratovarius' ability to delivery remarkable albums was at an end. 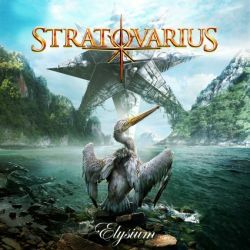 Elysium is perhaps not the best choice for those who have yet to experience Stratovarius (try Dreamspace instead), but for fans of the band and the genre this is an album that deserves space on your shelf/hard drive.